NeoStrata, a research-based dermatological company, was founded by Dr Eugene van Scott, a Dermatologist and Dr Ruey Yu, a Dermatopharmacologist in the USA. The NeoStrata brand was one of the first brands to be dispensed by physicians in 1988. 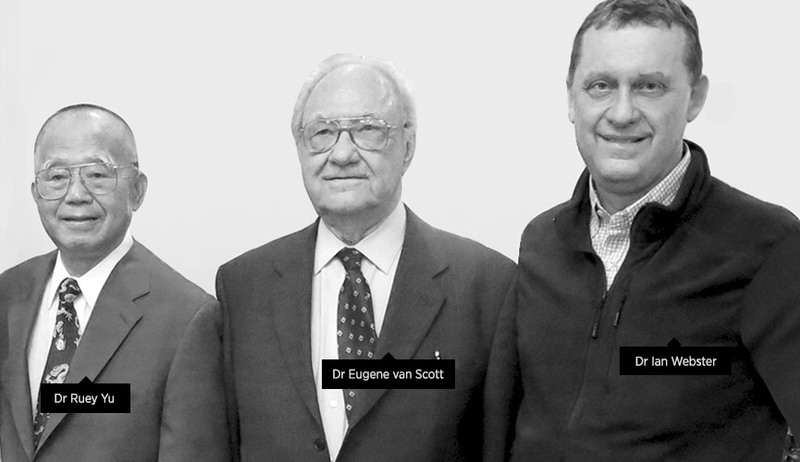 These two pioneering doctors shared a common interest in the growth and renewal process of the skin and this led to the discovery of how Alpha-Hydroxy Acids (AHA) benefited dry skin, ichthyosis, skin ageing and acne. The very first histology write-ups on the benefits of AHAs on the skin was attributed to them. In 1975 the first Alpha-Hydroxy Acid peel patent was issued to Dr van Scott and Dr Yu, one of many patents that spanned a partnership of more than 30 years of dermatological research and development. These patented ingredients are exclusive to NeoStrata, some of them taking up to two years to formulate. Many innovative, patented technologies that are unique to the NeoStrata brand are used in products across the brand today although some of the earlier patents have expired. Both Dr van Scott and Dr Yu were still involved in NeoStrata until recently when the company was bought by Johnson & Johnson in 2016. My wife and I had the pleasure of visiting the NeoStrata Research & Development Centre in Princeton, USA in 2014 where we met both these pioneering specialists. We were impressed by the very high standard of research and development that goes into all the NeoStrata products and equally impressed by what great skins both these doctors had in their 90s! The Skin Active range was launched in the US in 2011. This is an advanced, comprehensive anti-ageing regimen that targets all visible signs of ageing with a stellar list of unique ingredients supported by published clinical studies. I have personally been recommending this range to my patients with a more mature, sun-damaged skin, in my practice, since 2012. NeoStrata® was one of the first ranges I introduced to my online store, Dermastore® when it was launched in South Africa in 2015. NAG enhances cellular turnover to exfoliate existing pigmented spots. It improves skin tone and texture while also helping to prevent hyperpigmentation. NeoGlucosamine is a great suppressor of pigmentation as it inhibits tyrosinase, the key enzyme in the production of melanin. It is a building block of Hyaluronic Acid (HA), the skin’s natural filler, providing superior plumping and skin smoothness. Clinical studies using digital callipers have shown significant anti-ageing benefits with increased skin thickness and smoothness with reduced lines and wrinkles. It can also be used as a topical treatment for mild to moderate acne reducing oiliness and blemishes while improving skin clarity. It is less drying and stings less than some other conventional topical acne treatments. Aminofil® is a revolutionary patented amino acid. This breakthrough in anti-ageing technology was discovered by NeoStrata in 2013. It has a volume-building effect in the skin matrix, targeting deeper, repetitive expression lines and folds. It increases glycosaminoglycans (GAGs), pro-collagen and collagen development in the fibroblast cells. It can be used on its own or as an adjunctive therapy for injectables such as Botox and fillers to enhance this treatment. NeoCitriate® is a patented ingredient and its primary effect is to help stimulate collagen synthesis to increase skin firmness and it helps to build the dermal matrix, plumping and firming the skin. A product containing Neocitriate is the Skin Active Triple Firming Neck Cream which won Product of the Year in 2015. This is a humectant that is 40% more hydrating than the original Lactobionic acid. It is a pigment inhibitor helping to reduce UV triggered melanin production and it is an MMP inhibitor that prevents the degradation of critical proteins. It is both hydrating and healing. Drs van Scott and Yu patented Bionic acids, first Lactobionic and later Maltobionic acid which provide gentle anti-ageing benefits as well as and skin hydration without irritation. These include Glycolic Acid which is a small molecule that is able to penetrate into the dermis quickly and efficiently but it can cause irritation as it is an exposed acid. NeoStrata® has patented the Amphoteric system and this consists of 2 amino acids that encapsulate Alpha-Hydroxy Acids (AHAs) in the homecare products to lessen stinging and burning that is usually associated with the application of AHAs. Gluconolactone is a Poly-Hydroxy Acid (PHA) found naturally in the skin. It provides the same full-strength anti-ageing benefits of AHAs but without irritation. It is more moisturising and gentle. As the acid is encapsulated it will not sting or burn the skin and is an especially beneficial anti-ageing ingredient for patients with Rosacea or clinically sensitive skin. It helps to strengthen the skin barrier function, reducing sensitivity, irritation and skin redness so it is also beneficial after professional treatments such as laser surgery, Dermapen or chemical peels. Retinol is still seen as the Gold Standard of anti-ageing ingredients by Dermatologists worldwide. It is able to treat a variety of skin concerns such as pigmentation, skin ageing, acne, rough skin texture. NeoStrata have developed a product that brings together two potent anti-ageing ingredients: Retinol + NAG (NeoGlucosamine®). It is a unique targeted treatment that doubles results due to the synergy of these two potent anti-ageing ingredients. It is encapsulated for slow release and to reduce irritation. It should be used twice a week under a night cream. All active ingredients found in NeoStrata products including the Skin Active range are smaller than 500 Daltons which means they are able to penetrate into the dermis to stimulate collagen, elastin and GAGs. Orac (Oxygen Radical Absorbance Capacity) measures the value of an ingredient that scavenges free radicals i.e. the higher this value the more potent the ingredient at scavenging free radicals. The NeoStrata Skin Active Antioxidant Defense Serum is able to combat more than 40 000 free radicals and contains a potent blend of 8 antioxidants to combat free radicals which are unstable molecules that cause oxidant stress and DNA damage in the skin. 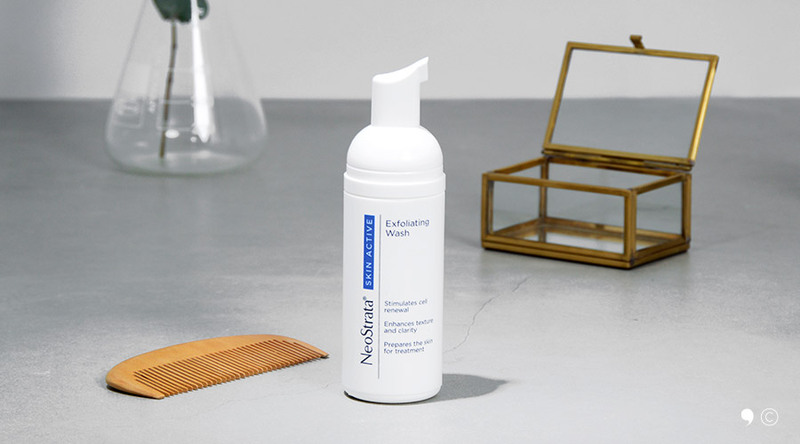 Start by cleansing with the Skin Active Exfoliating Wash, then follow with your Intensive Eye Therapy. From here, apply your Antioxidant Defense Serum, followed by your day cream Skin Active Matrix Support SPF30. Again start off by cleansing with the Exfoliating Wash, followed by Intensive Eye Therapy. From here, apply the Tri-Therapy Lifting Serum, allowing it a minute or two to fully absorb. Then apply your night cream, either Cellular Restoration or Dermal Replenishment. Skin Active Triple Firming Neck Cream (Daily PM/AM) is one of our most popular neck creams and we’ve only ever had positive feedback about it. You can also choose to add the Skin Active Retinol + NAG Complex (Twice weekly underneath your night cream), to additional boost your anti-ageing regimen. In closing, I can honestly say that for me, the magic of the NeoStrata® Skin Active range lies in the fact that the products work on all layers of the skin, penetrating deep into the dermis, increasing collagen, elastin and GAGs, while showing visible results on the surface of the skin … skin that is radiant and healthy. The products are backed by scientific data and clinical trials and as a Dermatologist this is of great importance to me. Posted in NEWS / Anti-Ageing on July 10th, 2017.